Fabulous large tureen with stand. The cover is from a Teutonic vegetable dish so does not have a ladle cut out, however fits perfectly. Backstamp: On stand BWM & Co Teutonic, impressed Brown Westhead Moore & Co and registration mark for 1872, on tureen impressed Brown Westhead Moore & Co. Underneath the stand there is a little minor discolouration otherwise excellent condition. 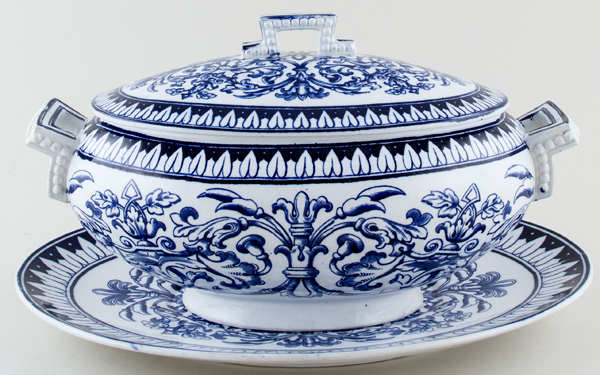 The Tureen has some wear and discolouration to the rim and inside with just a little to the side handles and foot. The cover also has a little wear underneath. Overall a fabulous set. OVERSEAS SHIPPING OUTSIDE EUROPE Owing to the size of this item a supplement of � about US$68 will be added to the standard overseas shipping charge.